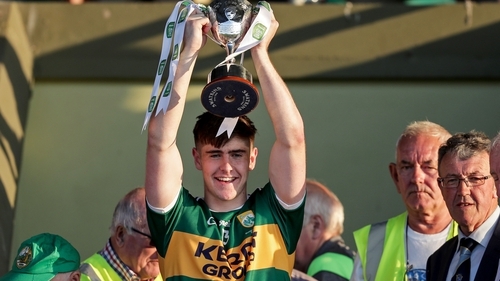 Kerry completed the minor, junior, senior and Under-20 full house of Munster titles after claiming the latter with a six-point win over Cork to underscore the Kingdom's total dominance in the province after a hugely successful week. On Wednesday Kerry saw off Cork in the junior final - four days after the senior and minor titles were retained - and now the inaugural U20 title will winter in the Kingdom too. It was comfortable in the end for Kerry but it took second-half goals from a substitute and the penalty spot for Kerry to shake off a Cork side that gave the hosts lots of it for the first three-quarters of the but they struggled when they went behind to those game-changing scores. That substitution came in the 41st minute with the introduction of Eddie Horan who, with his first touch, was to hit the net to put Kerry 2-06 to 0-10 in front. Twelve minutes later Donal O'Sullivan was dragged down in the square with Mark Ryan sliding his low penalty kick past Ian Giltinan to make it 3-09 to 0-12. It took Cork just 15 seconds to open the scoring, Mark Keane tapping down the throw-in to midfield partner Colm O'Callaghan who did the rest. Damien Gore and Colm Barrett added points to put Cork three up in as many minutes, but Kerry settled into the game and were back on terms with scores from Cormac Linnane, Fiachra Clifford and Donal O'Sullivan as the game took on the ebb and flow of a decent Munster final. Mark Keane's 11th-minute point nudged Cork back in the lead but then the hosts hit the front when David Shaw fielded high over Liam O'Donovan, turned and placed a low shot beyond Giltinan to make it 1-03 to 0-04. Bloodied but unbowed Cork responded with the next four points, three from Chris Og Jones, to put them back in front, 0-08 to 1-03, and it was matters even, 1-06 to 0-09, at the interval. An early Jones free put the Rebels in front again and Kerry struggled in that opening period of the second half, but when their first score of the half arrived in the 41st minute it was a game changer. Clifford did the approach work to set up Horan for his goal, and the home side were in the ascendancy thereafter. Clifford and O'Sullivan were the pick of the Kerry forwards but the defence stood firm too, Stefan Okunbor putting in a man of the match performance at full back, and the half back line finding a winning balance between defence and offence. Cork will rue some needless turnovers and poor accuracy in a game they were comfortable in for 40 or so minutes, but the old adage of goals winning games rang true. So, the quartet of minor, U20, junior and senior titles will winter in the Kingdom, with this team now set to face the Leinster champions in the All-Ireland semi-final. Cork: Ian Giltinan, Nathan Walsh, Sean Walsh, Kevin O’Donovan, Liam O’Donovan, Aidan Browne, Tom Linehan, Colm O’Callaghan 0-02, Mark Keane 0-02, Maurice Shanley, Tadhg Corkery 0-01, Cathal Maguire, Colm Barrett 0-01, Chris Óg Jones 0-07 (0-03f), Damien Gore 0-01. Subs: Sean O Sullivan for C Maguire (ht), Killian Myers Murray for M Shanley (37), Matthew Bradley for C Barrett (50), Mark Cronin for D Gore (50), Liam Wall for S Walsh (50), Alan McCarthy for K O'Donovan (54, b/c).